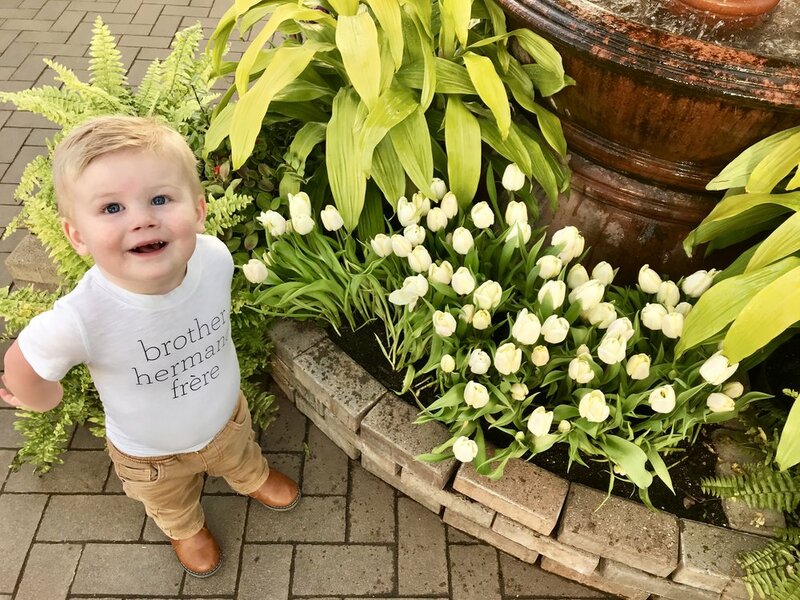 Kladder Update: Spring Has Arrived & Thomas Is Two!! Our youngest is officially no longer a baby, despite him not looking like one for some time; Thomas turned two on March 27th and remains in the 99th percentile for height and weight. I foresee being eaten out of house and home a constant trend in our near future. 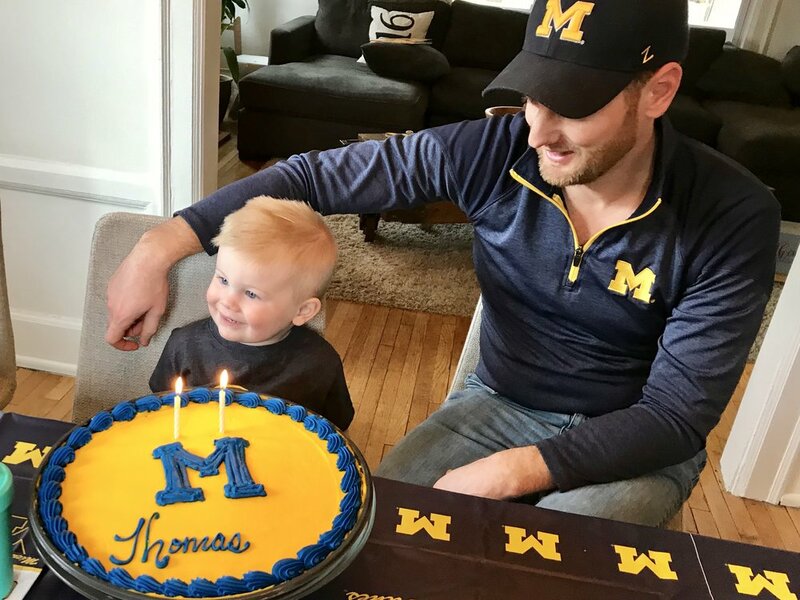 To celebrate we hosted my family for little party at our house with a University of Michigan theme: Thomas is Two! Go Blue! My planning would have been much more appreciated had the Wolverines remained in the March Madness basketball tournament, but alas, good ole maize and blue got knocked out two days before Thomas’ big day. So, it’s probably my fault they lost! But Thomas didn’t care… he was all smiles at his birthday party as the entire family sang to him before blowing out his candles - something big sister Natalie helped him do. Adding Thomas to the family two years ago has meant double the fun. When he arrived it’s like we never skipped a beat and we’ve been cruising ever since. Thomas is loud and smiley. He’s stubborn and knows what he likes… his latest obsession is peanut butter and jelly (you and me both, buddy) and he’s been eating PB&Js for breakfast lunch and dinner - it could certainly be worse in my opinion! He thinks he’s funny and does a good job testing his limits with us and Natalie which lands him in timeout on average 4 times daily. He’s a great sleeper, always has been, loves snacks and milk and talks a ton despite us having to guess on most of what he says. He loves his pacifier, wearing shoes, throwing balls, taking walks in the stroller and all the playgrounds. He’s our boy and we’re lucky to have him. 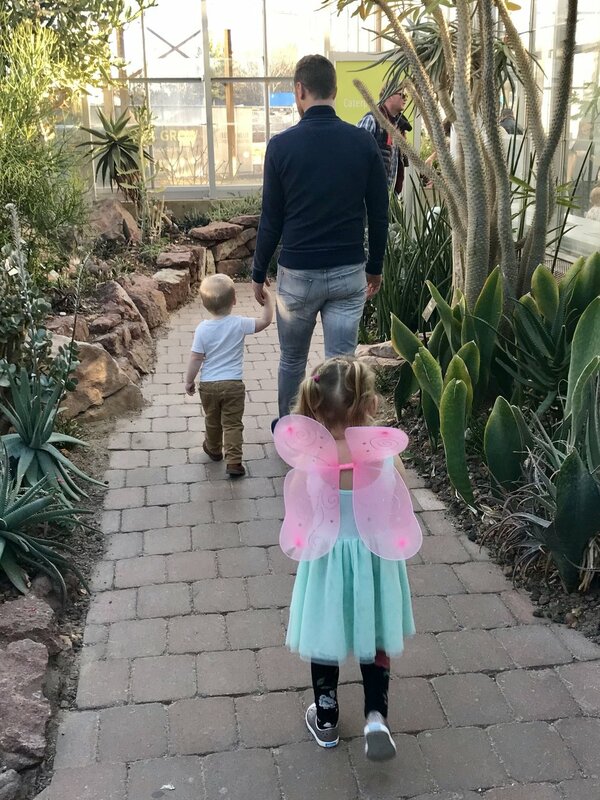 Earlier that week we took a family field trip to see the butteries at Frederick Meijer Gardens. It’s an annual event so you’d think I would have learned by now that a winter sweater inside a hot and humid conservatory is a bad wardrobe choice. Word to the wise, dress accordingly! The butterflies were certainly blooming and could be found everywhere. Thomas took what seemed like a billion laps around the room while Natalie kept her eye out for birds. At this age everything is either 1. Mia (the name of the Robin from her favorite TV show Sofia the First) or 2. it’s a straight up eagle. Grandpa Kladder is a big bird fan and obviously needs to spend some time with her on names/types of birds. Uncle Jason and Aunt Rachel (my brother and sister-in-law) took Natalie to see the Dumbo live action movie opening weekend at Celebration Cinema as their first ‘niece date.’ It sounds like she ate her bodyweight in popcorn and sugar and had a fabulous time. If you ask her about it be warned, complete spoiler alert… “Hey Natalie, how was the movie?” Natalie, “Dumbo lost his mom and then he flies and then he finds her again.” Alrighty. Jay and Rachel taking her out gave me all sorts of warm fuzzies… I have the fondest memories of when my Aunt Kelly would take me on niece dates. It makes me happy. The monthly event my gal pals and I fondly refer to as ‘Housewives (fill in the blank)’ met for Housewives Brunch two weekends ago for mimosas and chit-chat. It’s becoming more and more difficult to stay in touch with everyone in the group and these gatherings are easy times for us to do just that. No kids, no husbands, just us filling one another in on the latest family vacations, career moves, fitness routines and everything in between. April is my month to plan and in effort to get outside as much as humanly possible I planned a coffee walk around Reeds Lake. Looking forward to it. Book Club wrapped up The Marsh Kings Daughter by Karen Dionne last month and man was it good. It takes place in the Upper Peninsula of Michigan which made the book doubly interesting - after spending Smith family vacations there every summer since I can remember, the U.P. is like a second home. If you need a good Spring read, I recommend it! Next month we’re tackling the extremely popular Where the Crawdads Sing by Delia Owens. I was #112 on the Kent County Public Library waitlist for it when a friend of mine saved me with her copy of the book. Apparently it’s good! I’m still really enjoying being part of the group and look forward to continuing to meet throughout the summer months. Two weekends ago our good buddy Timm was in town from Chicago and we checked out the newly opened Hancock on Wealthy Street. I’m not a huge fried chicken fan but holy moly was it tasty! We ordered the ‘hot’ and it was the perfect balance of sweet/hot and left all of our lips burning. I honestly cannot imagine what the two levels beyond ‘hot’ are like! The waffle fries were also tasty and we cannot wait until their outdoor space opens because I’m picturing Friday night family walks with the neighbors for dinner and drinks very soon. While Timm was in town we also grabbed drinks and some more bites at another hot spot in town, The Commons. Jeff and I are still big fans of their apps (we’ve still not eaten dinner there) and their atmosphere - there’s no place like it in GR. If you’re looking for a fun place for date night or to take some out-of-towners you might consider this place. Alternatively, what I might not recommend for a place to take friends visiting from out of town but would consider one of the best places for families in Grand Rapids is Big Bobs in Gaslight Village. We continue to dine here with our kids and our friends with kids and have yet to be disappointed. They too have a nice outdoor space and we’re extremely partial because it’s a stroller ride away which means we can walk off our pizza on our commute. They’ve got TVs with sports, a popcorn machine and pour a great vodka soda! Perhaps some of the most exciting news as of late is that I finally got the opportunity to utilize my new power washer toy! I tackled the garage door on Sunday which is something that’s been bugging me since last summer. I had tried to scrub off the grubby lower section of the door with some bleach and a brush with next to no success. But the power washer was clutch and now I’m hooked! We’re never paying for a car wash again! And while you were all getting tan in Florida, us Kladders held down the fort here in Grand Rapids - someone had to. But on Saturday we treated ourselves with some quality day drinking and our first round of golf at Watermark (together anyway - it’s no surprise Jeff has enjoyed golf already this season). The weather on Saturday was glorious and it was so nice to soak up the sunshine if only for the day. It’s got me all sorts of excited for the upcoming golf season. Last, I’m adding a new section to our Kladder Updates called: On Deck. Here I’ll list out a few of the events we’re planning on or recommend in town. I figure we do a good job reporting what we’ve done, but not so much on what’s next. And as always, if you’ve got content or events you’d like to partner on let us know! We’re big advocates of Grand Rapids and the great things happening within. Date Night: St. Cecilia’s Eat. Drink. Be Merry. Wine Tasting Event on Saturday, April 13th @ 6p. We’ve gone the last two years and have had a blast! The event benefits St. Cecilia’s Music Center. 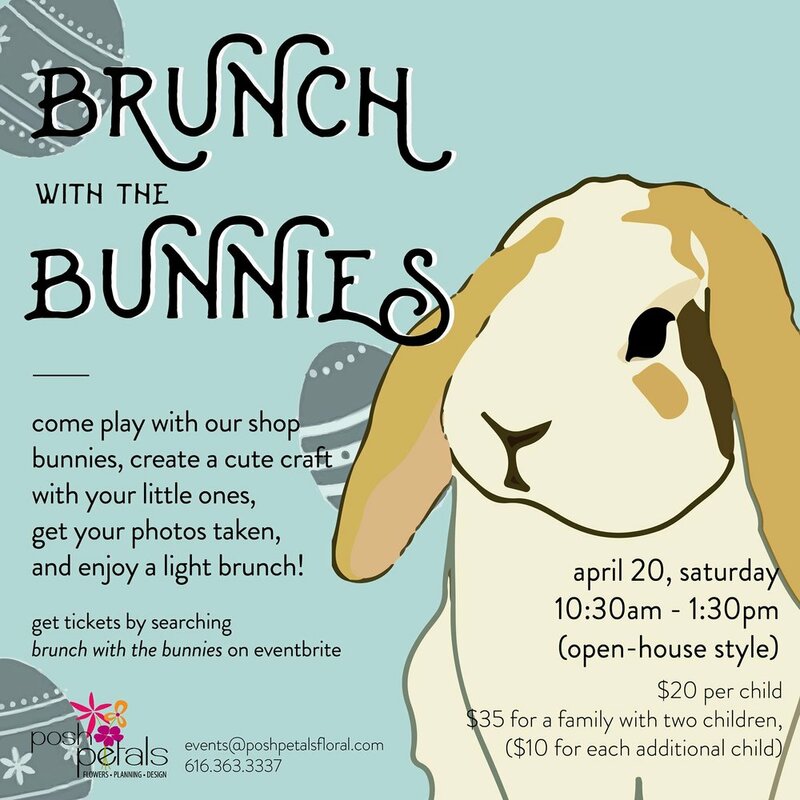 Family Outing: Brunch with the Bunnies by Posh Petals on Saturday, April 20th from 10:30a to 1p. I’ve taken Natalie in the past and it was adorable. Ladies Night: Watermark Women’s Association Spring Mixer on Wednesday, April 17th @ Watermark CC. If you are someone you know is interested in joining our golf crew on Wednesday evenings, this is a great event to check out. It’s free!